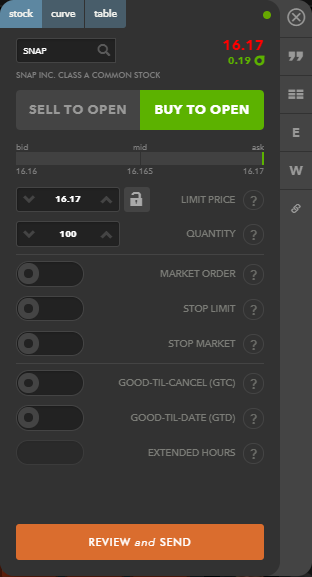 tastyworks is great for options trading. It has very low options trading fees and the trading platform is also primarily designed to trade options. There are great research and education materials. The customer service is very responsive and relevant. tastyworks is mostly good for options and futures. Trading US stocks is possible, but complicated on the platform. The trading platform can be intimidating for a newbie, and also had some bugs. 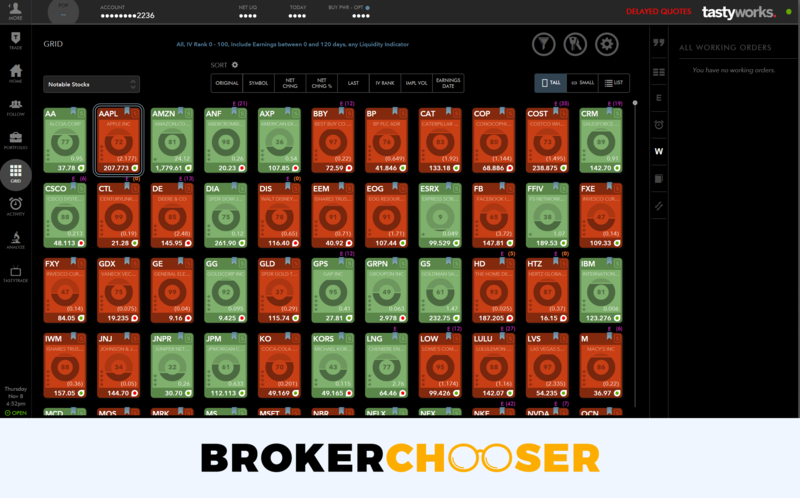 We compare tastyworks fees with its peers, DEGIRO and Interactive Brokers. tastyworks' trading fees are low. It is the lowest for US options trading and also low for US stocks. Because of this, it is recommended for frequent options trading too. Its fee terms are easy to understand, it charges only for opening a position. Closing the position is free of charge. 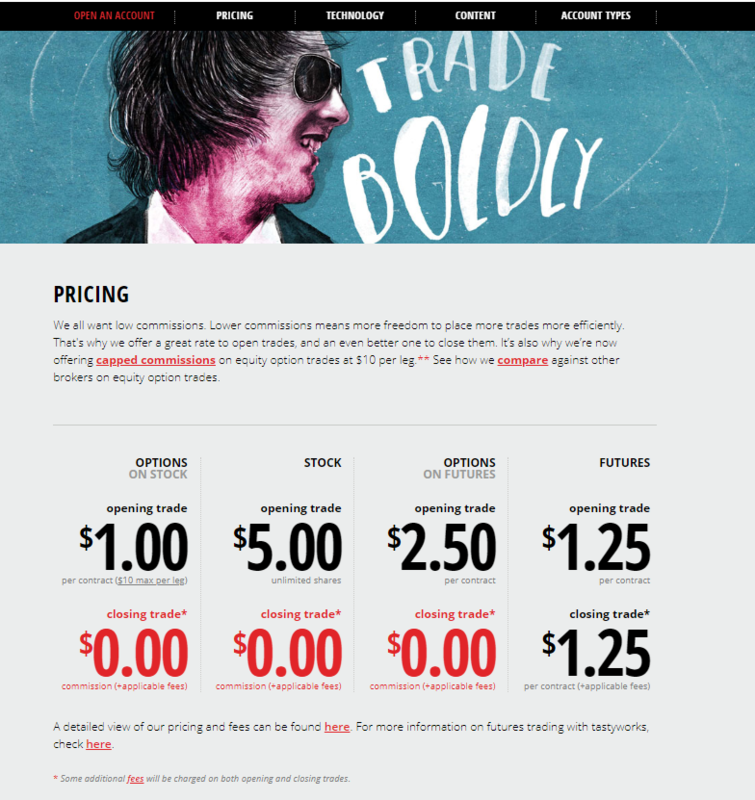 tastyworks charges $1 per contract for options and a fixed $5 for a stock trade. For futures it charges $1.25 both for opening and closing the trade. tastyworks has low US stock trading fees. In our comparison table, we halved tastyworks' fee to be comparable with the other brokers, which charge both for opening and closing. tastyworks is not as low as Degiro and IB, but it is all right. Because of its fixed fee, tastyworks can be better than Interactive Brokers and DEGIRO if the ticket size is larger than ~$25,000. tastyworks' US options fees are very low, also when compared to other low cost brokers. tastyworks' US futures fees are average. 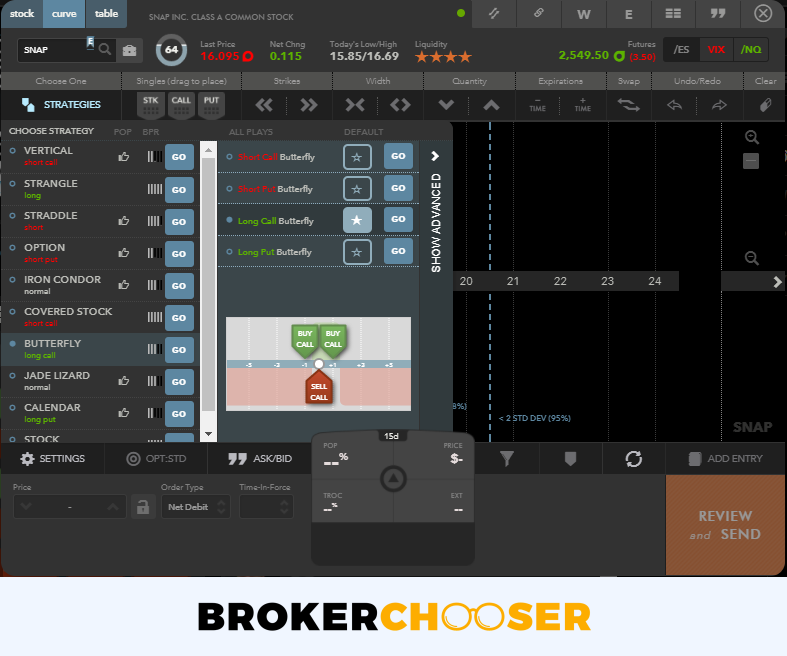 Both Degiro and Interactive Brokers have lower fees. Tastyworks financing rates are high. When you trade with leveraged products you are borrowing money from your broker. If you keep the position for more than a day, you pay the financing rate. tastyworks financing rate is volume tiered. It applies a base rate and premium or discount depending on financed amount. The base rate is set by its discretion, at the time of the tastyworks review the base rate was 7%. Tastyworks’ non-trading fees are average. On the bright side there is no account fee, inactivity, custody fee, or deposit fee. However, tastyworks has a relatively withdrawal fee, $25 for US citizens and $45 for non-US. The complete list of non-trading fees can be found on tastyworks’ pricing page. tastyworks accepts customers from a lot of countries, ~50. You can find their updated list at tastywork international account. Almost all EU countries, most South and Central American countries, India, Indonesia, New Zealand, and Turkey are all eligible. There is no minimum deposit for cash account, for margin, you need a $2,000 to retain full margin privileges. 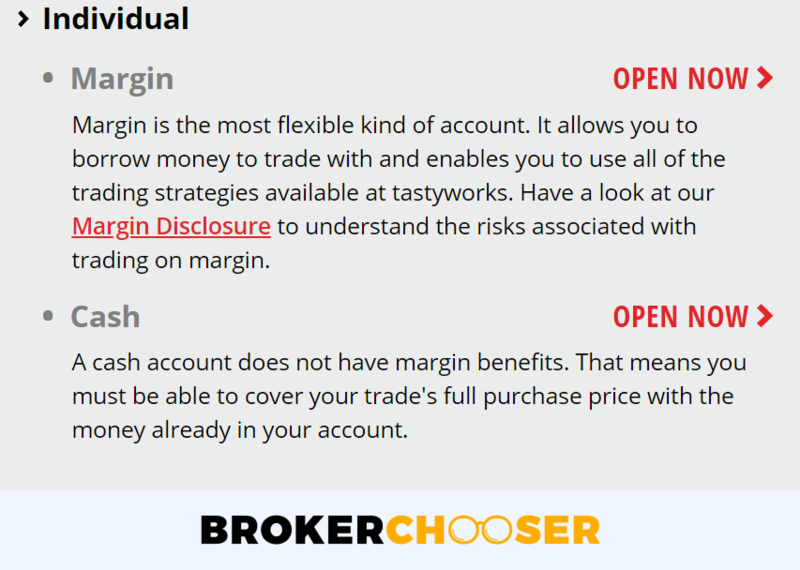 tastyworks offers two accounts for individuals: cash and margin account. With a margin account, you can use leverage. Leverage means that you borrow money from the broker to trade. There a is also a retirement account. It is only for US citizens. You can choose between traditional and roth IRA. Furthermore, you can use a joint account. In this case, there is more than one owner. 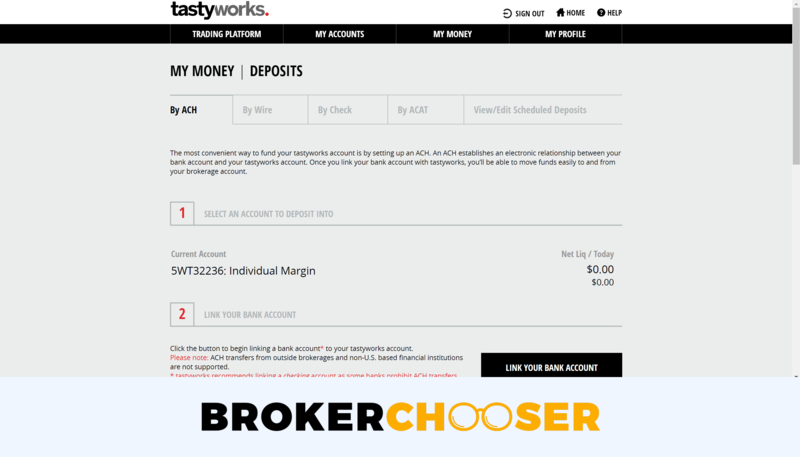 In our tastyworks review, we tested the individual margin account, dubbed as "the Work". tastyworks account open is fast, and fully digital. For regulatory reasons, US brokers cannot open your account instantly. 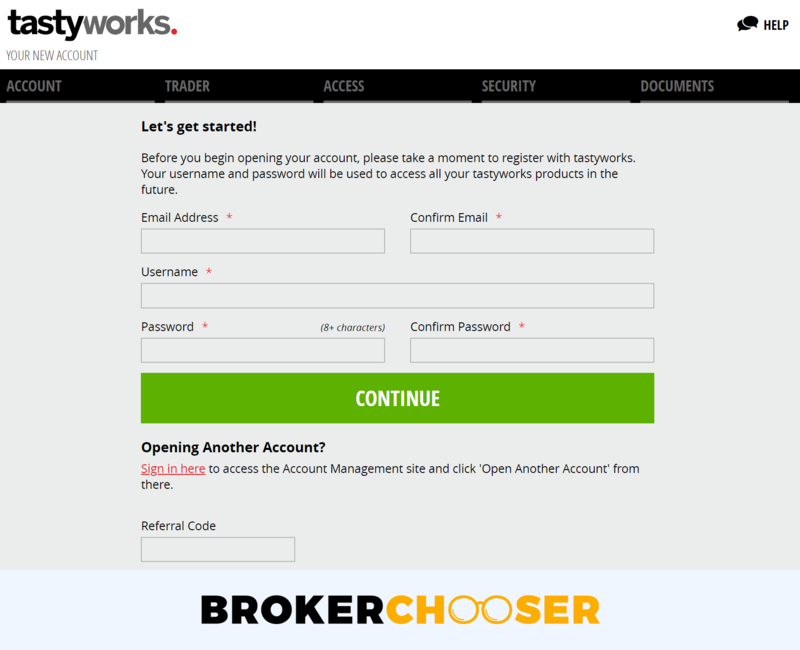 tastywork account opening is one of the fastest among US brokers. tastyworks offers a 1 to 3 days approval time. One time, our account has been approved within the same day, the other took 2 days. digital copies of your ID and address. tastyworks only operates USD accounts. Why does this matter? Because if you deposit non-USD, it will be converted to USD. Tastyworks offers an option to circumvent this by accepting money transfers by CurrencyFair. tastyworks deposit is free of charge. However, non-US citizens can only use bank transfer, known as wire transfer in the US banking lingo. There is no information about how long the bank transfer can take. We tested the non-US bank transfer and it took 4 business days. tastyworks withdrawal costs $35 for non-US clients, while $25 for US clients. Withdrawing money can be done the same way as making deposits, e.g. only wire transfer for non-US citizens, plus ACH and check for US citizens. The user interface for withdrawal wire transfer is customer friendly and easy to use. tastyworks does not provide information how many days the withdrawal can take. We tested the non-US bank withdrawal and it took 3 business days. tastyworks uses its own trading platform. It is targeted for options traders and stock trading is only a secondary focus. tastywork platform is for experienced traders, but this does not mean the platform is ugly or spartan. It is a well designed, usable professional platform. You partly have the feeling this is how a professional platform should look like and it also scares you a bit as it looks very complicated. It is equipped with a very strong option trading panel. We could found everything with a little bit of practice. The platform had quite a few bugs in 2017, felt like an early release. In our 2019 review, we saw all of the previous errors we had seen were corrected. The platform is not customizable, so you have to live with the default view. The default view is ok though. tastyworks applies a single username / password login. The two-factor authentication is described on its security page, but we could not find how to set it up. tastyworks search function is fast and gives relevant results. However, it is not obvious which exchange the underlying asset is listed. When you search a non-US stock, it gets listed on the drop down, but the price information does not load and you cannot trade with it. This is a bit annoying, but if you concentrate on US assets, you will be fine. tastyworks's order management is super, a bit complicated at first sight. It is primarily for options trading, but can also be used for stock trading. You will find three different order panels, two for options trading and one for stock trading. For the options trading, you have two views: the standard option chain, called table and a unique visual trading interface, called a curve. Within the curve view, we always had the feeling of sitting in the cockpit of an alien starship. It looks very complicated for the first, but you can also feel it must be very practical after getting the hang of it. And indeed, it is practical and useful. 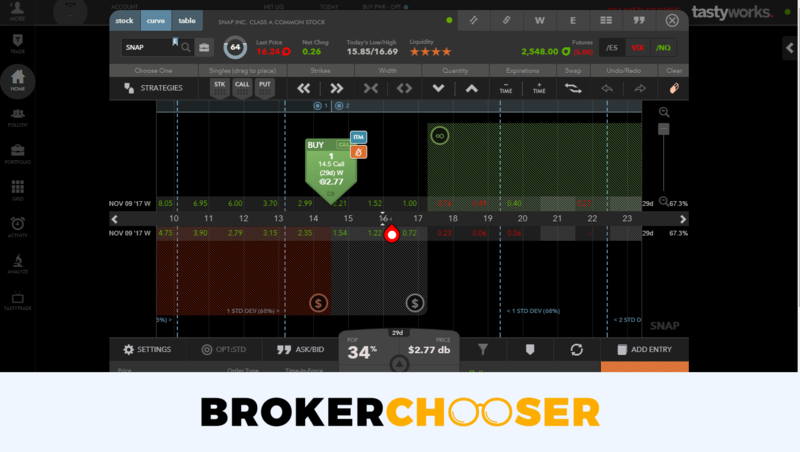 For example, a list of predefined option strategies are available, so opening an iron condor can take only two clicks. 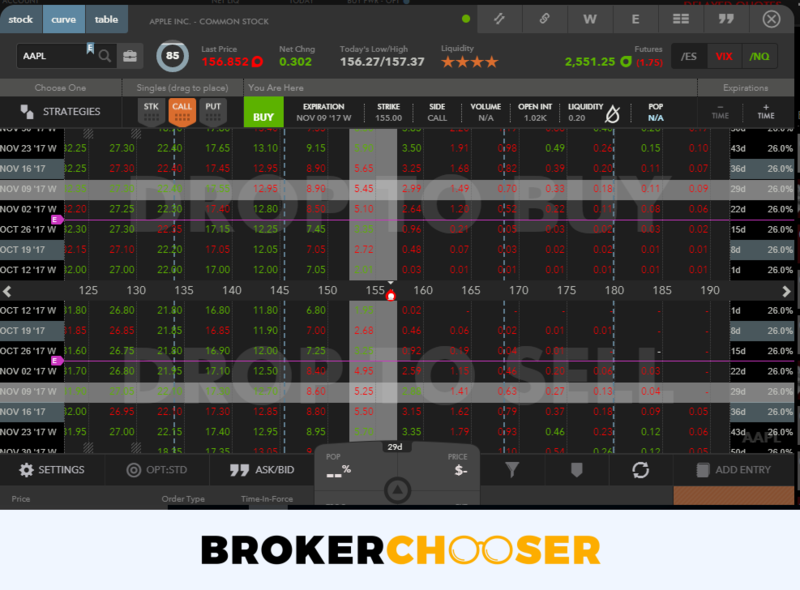 You can also drag and drop the different option orders and easily edit the default parameters. We think this is one of the biggest selling points of the platform. It is easy and self-explanatory to set up alerts and notifications. You can set up alerts for each asset for price and IV level. You can set up email, and push notification, and we assume also SMS if you are in the US. There is a great watchlist called Grid. 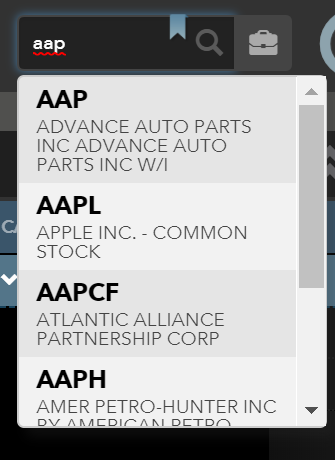 You can overview a wide range of assets in one view. All selected stocks have a well organized mini infographic with some fundamental data. This is also tailored for options trading, e.g. the most visible data points are implied volatility ranks. The portfolio report is well structured. Its default setting is options trading focused by showing e.g. delta values. On the other hand, the columns of the table can be easily customized. The fee report is also clear. Both the portfolio and fee report can be really easily exported to a CSV. tastyworks mobile platform is very similar to its web platform. It is well-organized, but feels complicated. tastyworks mobile platform is a good platform. It has all major functionalities of the web platform. We only detail what is different. It is available on iOS and Android. We tested it on iOS. The trade function is a bit different but intuitive. You need to choose between table, curve and stock mode. This makes the stock mode easier to manage. The desktop platform is practically the same as the web platform with a different layout. E.g. the stock order entry panel is missing, there is no grid, etc. The differences can be confusing at the start, but in an hour you will find everything. tastyworks offers only stocks, options, and futures. It only covers US markets. Usually, we benchmark brokers by comparing how many markets a broker cover. We could not figure out how many exchanges tastyworks covers. If you are planning trading with really small US stocks or options, it is best to contact their customer support first. tastyworks' research tools are quite limited and focused mainly on options trading. E.g. it does not provide fundamental data or technical analysis tools. These are specifically not investment advice, but there is a quasi-social trading feature. 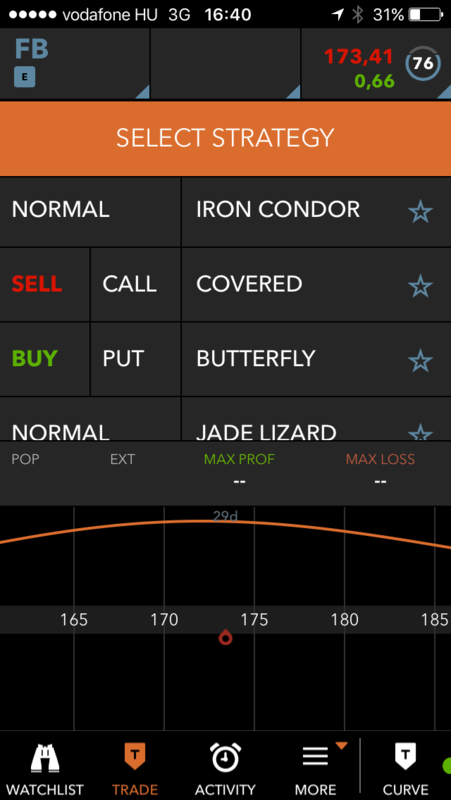 You can follow and copy the trades of the tastyworks' team members. The guys are really active, so you will never struggle from not having trading ideas. There are useful indicators for options, like the greeks, implied volatility, tastyworks’ proprietary IV rank, or the correlation matrix with stocks and indices. You will find only very basic fundamental data for stocks, like P/E or dividend yield. 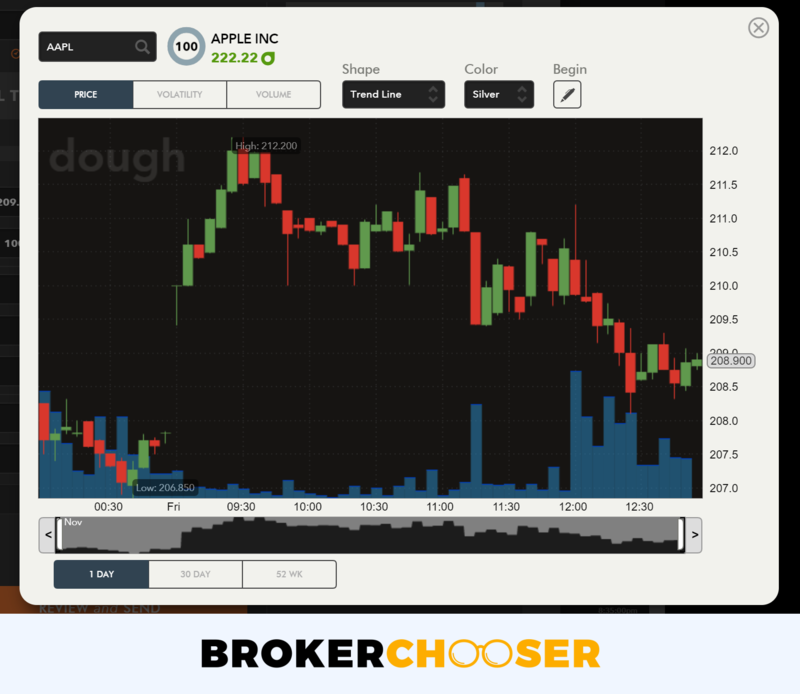 The technical analysis and interactive chart function are underdeveloped compared to other brokers. So if you trade stock based on the charts, this is definitely not your platform. One of the useful ones is the volatility chart, again, targeting option traders. 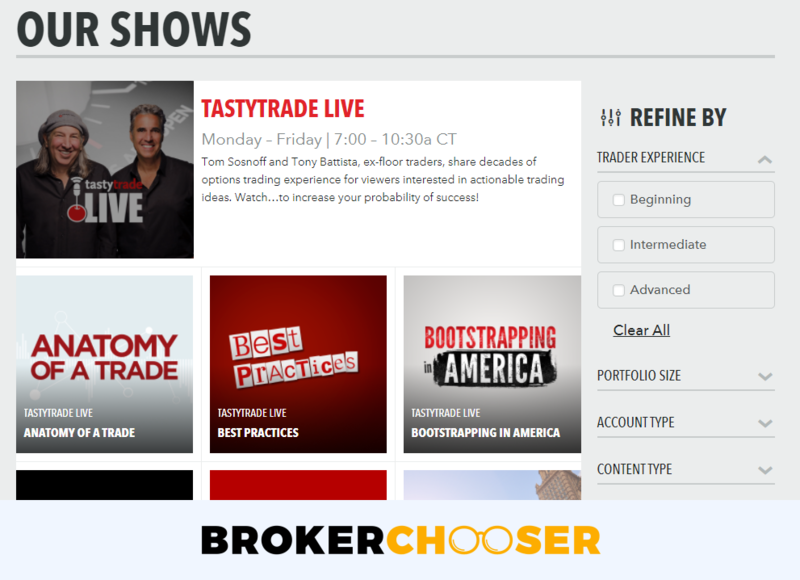 Tastytrade, the video streaming service is a lively channel. You have access to a wide range of very useful option and futures trading contents. 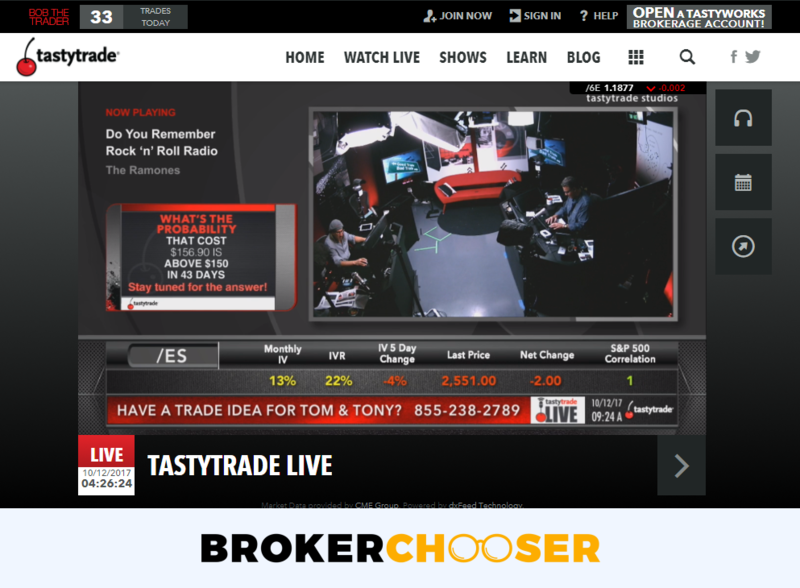 The tastytrade team runs a live trading show throughout the whole trading time each weekday. 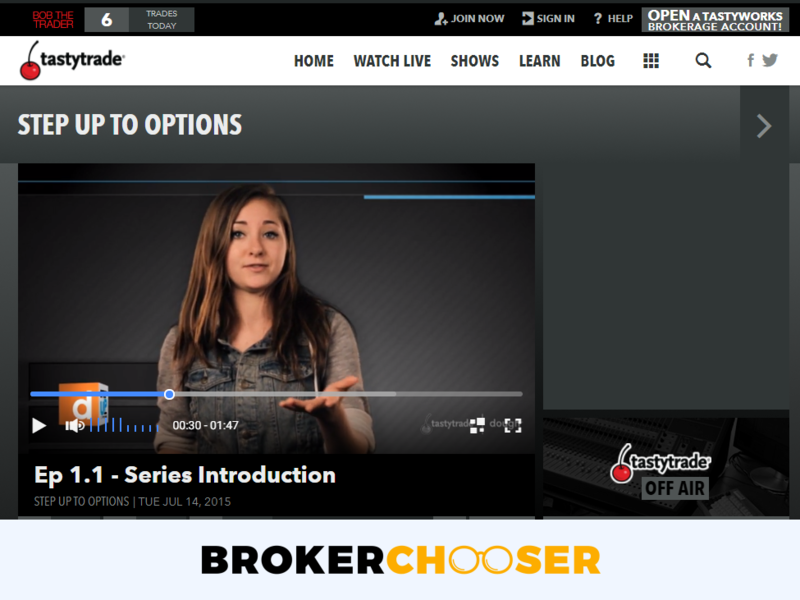 They cover interesting and valuable content about options and trading. Parallel to the live show you have access to several other thematic video series (also called shows) and even trading documentaries. tastyworks' customer support is great. 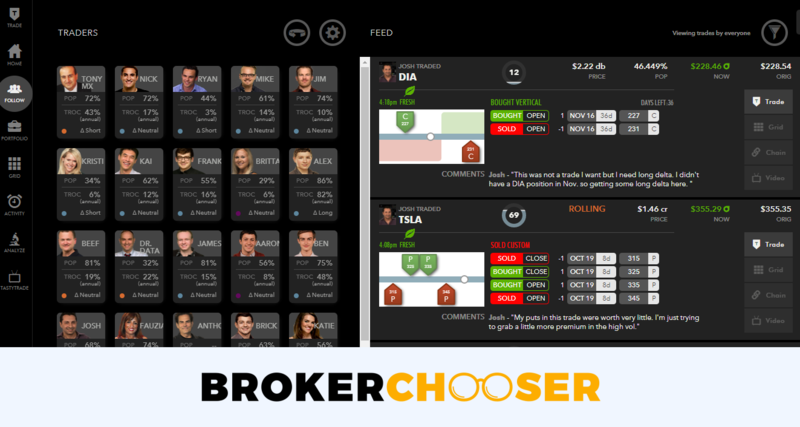 It was the best among the 20 brokers we tested. You can reach them via chat, email and calls. The customer service is available in English. Our agents seemed to be from the tastyworks, not like an outsourced agent. We had very good experiences when we tested their support. They were super quick, also on email. The answers were professional. The only thing which could be improved is the customer service is not working on weekends, just 24/5. tastyworks' education materials are state of the art. It makes great videos. You can build up your options trading knowledge from the scratch. The educational videos have really good quality and are also enjoyable. It is a big plus when you are consuming financial content. We especially liked the tone of Rachel’s introduction video course, the “Step up to options”. If you want more, you can find useful articles on the tastytrade blog. We did not like, that even though the platform is quite complicated, there is no demo account to practice. The newly started tastyworks is regulated by the top-tier US regulator. Hence, you get a high investor protection amount. On the flip side, it is not listed on stock exchange and does not disclose financial information. tastyworks is a US broker established in 2017 serving clients globally. Is tastyworks safe? To be certain, it is best to check two things: how are you protected if something goes south and what the background of the broker is. tastywork covers all customers by one US legal entity. It is regulated by FINRA. This matters because this case you get the US investor protection amount, It is called SIPC. This is a big plus. It protects against the loss of cash and securities in case the broker goes bust. The limit of SIPC protection is $500,000, which includes a $250,000 limit for cash. A non-U.S. citizen with tastyworks is treated by the SIPC the same as a US resident in case something goes south. The $500,000 ($250,000) is a substantially higher amount than most European investor protection schemes. 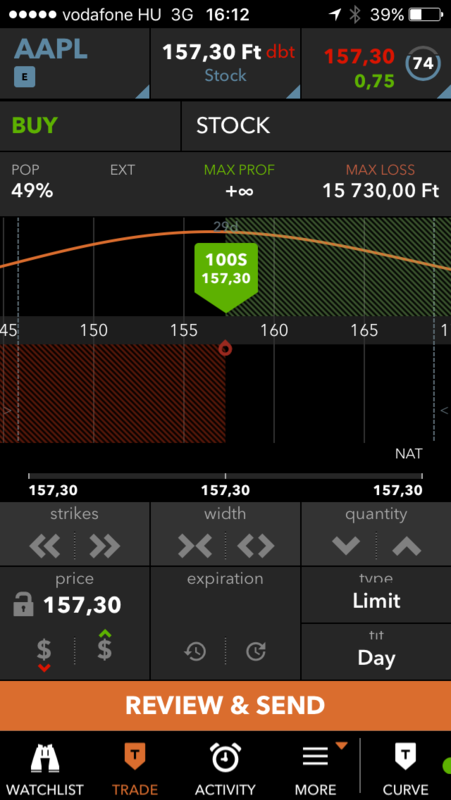 However, tastyworks does not provide negative balance protection. tastyworks was established only in 2017. The longer the track record, the better. It means the company was able to manage financially through tough times. tastyworks is still quite new. tastyworks was founded by Scott Sheridan, Kristi Ross, Linwood Ma, and Tom Sosnoff, entrepreneurs and well-known industry experts, who already have proven track record with thinkorswin, another broker, now operated by TD Ameritrade. tastyworks is a private company. It was hard for us to find well disclosed financial information about the company. Being a US regulated broker is a great sign for tastyworks' safety.